Keywords are one of the most important parts of your marketing campaign. Without them, you won’t be able to reach your target audience, or rank in search engines for the keywords your audience is looking for. Though basic keywords are important, long-tail keywords or keyword phrases are even more important. On this page, we’ll take a look at long-tail keyword research – a powerful kind of search term that can lead to more conversions, lower your costs, and drive your specific target market to your site. By definition, long-tail keywords are terms that are in groups of three or more words and are highly targeted to a specific group of searchers and their intent. By doing this, they can focus their keywords and start drawing users to their site that have the intent of converting and purchasing a jersey. Long-tail keywords narrow down the results on the search engine ranking pages, or SERPs, and display more specific results that are focused on user intent – usually for users with the intent of converting. Long-tail keywords are also less difficult to rank for since they are so specific and therefore have a lower competition rate. Long-tail keywords have less search volume but have a lower competition rate and higher conversion rates as a result of their specificity. When you target long-tail keywords to what your users are searching for, you can become the authority in your niche. You identify search queries that your target users are looking for. Long-tail keywords have such a high conversion rate because they focus on users who are searching for more information that your site can specifically provide to them. Less competition means higher rankings for your site. You’ll be getting the most relevant content directly to users who are searching for it. You save money! There is less competition for long-tail keywords and therefore the cost to you is less. Who can say no to higher rankings at lower costs? Long-tail keywords make up around 70% of all searches but can be hard to find and implement if you don’t know where to start. Begin your long-tail keyword research strategy by thinking in the mindset of searchers. Long-tail keywords come from looking at common questions in a natural language. You can create your own long-tail keywords by pairing “how to” or “where to find” to action words such as “buy” or “purchase” to a specific product or service attributes. This will result in keywords that are targeted directly to your intended audience. By doing this, you not only get more traffic to your site but also more conversions since you are driving users who are at or are likely close to the conversion stage. It’s important to keep in mind user intent as you’re going through this process and keep everything you’re doing relative to what they’re looking for. 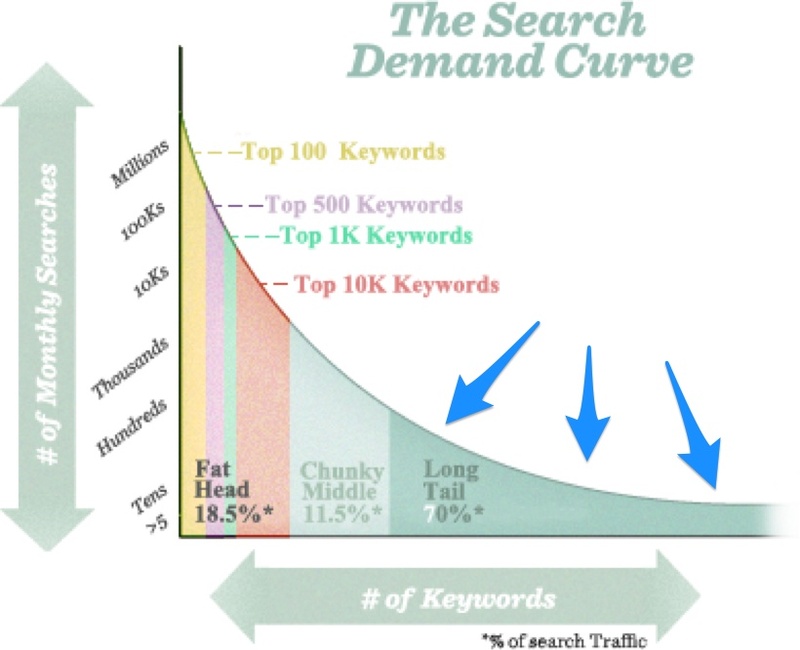 Looking for more on long-tail keywords and inbound marketing? Contact the Inbound Marketing Inc. team to continue to learn more and to take the next step towards improving your business today!